Azure SQL Database is a cloud database service from Microsoft. SQL Database provides web-facing database functionality as a utility service where you pay only for what you use. Cloud-based database solutions such as SQL Database can provide many benefits, including rapid provisioning, cost-effective scalability, high availability, and reduced management overhead. This paper provides an architectural overview of SQL Database, and describes how you can use SQL Database to augment your existing on-premises data infrastructure or as your complete database solution. Companies that provide Internet-based applications are facing many challenges today. Users expect access to ever-increasing amounts of data from anywhere, at any time, and from any device. The size, scale of use, and variety of forms of data are expanding rapidly. Developers must build and deploy applications quickly to keep up with these growing demands. Using the traditional on-premise data management model, meeting these needs demands constant investment in and management of servers, operating systems, storage, and networking. IT and operational staff must constantly monitor the infrastructure to ensure that capacity, performance, and availability are maintained as data volumes and user loads increase. Cloud database services, such as Windows® Azure SQL Database, provide an improved way to respond to these challenges. SQL Database is built on three key tenets: manageability, scalability, and developer agility. From a developer's perspective, SQL Database offers the well-known rich relational programming model, and uses a familiar data access protocol and simple deployment options. SQL Database simplifies the process of creating, prototyping, and deploying applications that integrate data across the enterprise. SQL Database removes infrastructure obstacles, thereby giving developers more freedom to innovate and experiment with new ways of sharing data. From the IT management perspective, SQL Database offers a systematic and secure cloud-deployed solution that integrates with your on-premise assets and gives the IT organization oversight and control of distributed data assets. SQL Database is built on the same Microsoft SQL Server® technologies that have already been used and proven in on-premise deployments to provide high availability, reliability, and security. From the business perspective, SQL Database offers a cost-effective approach for managing data, with a flexible consumption-based pricing plan, near-zero capital and operational expenditures, and the ability to quickly and easily scale up or down as your needs change. If you are planning to build applications on large or shared data sets, provide on-demand scalable data storage, or augment your on-premise data infrastructure with low-cost, rapidly provisioned cloud-based storage, SQL Database can provide a robust and cost-effective solution. SQL Database is a key component of the Microsoft data platform offering flexibility and scalability; reliability and security; and developer agility. Let’s begin by looking at some of these features. Windows Azure SQL Database offers the high availability and functionality of an enterprise data center without the administrative overhead that is associated with an on-premise solution. This self-managing capability enables organizations to provision data services for applications throughout the enterprise without adding to the support burden of the central IT department or distracting technology-savvy employees from their core tasks to maintain a departmental database application. When you use the traditional on-premise data infrastructure, the time that it takes to deploy and secure servers, network components, and software can slow your ability to prototype or roll out new data-driven solutions. However, by using a cloud based solution such as SQL Database, you can provision your data-storage needs in minutes and respond rapidly to changes in demand. This reduces the initial costs of data services by enabling you to provision only what you need, secure in the knowledge that you can easily extend your cloud-based data storage if required at a future time. SQL Database is built on robust and proven Windows Server® and SQL Server technologies, and is flexible enough to cope with any variations in usage and load. The service replicates multiple redundant copies of your data to multiple physical servers to ensure data availability and business continuity. In the case of a disaster, SQL Database provides automatic failover to ensure maximum availability for your application. Published service level agreements (SLAs) guarantee a business-ready service. When you move to SQL Database, you no longer need to back up, store, and protect data yourself. A key advantage of the cloud computing model is the ease with which you can scale your solution. Using SQL Database, you can create solutions that meet your scalability requirements, whether your application is a small departmental application or the next global Web success story. A pay-as-you-grow pricing model allows you to quickly provision new databases as needed or scale down the services without the financial costs associated with unused capacity. With a database scale out strategy your application can utilize the processing power of hundreds of servers and store terabytes of data. SQL Database runs in worldwide data centers, so you can reach new markets immediately. If you want to target a specific region, you can deploy your database at the closest data center. You can harness this global scalability to build the next generation of Internet-scale applications that have worldwide reach, but without the infrastructure costs and management overhead. Independent software vendors (ISVs) who develop Software+Services (S+S) offerings must provide adequate isolation for individual customers’ data. ISV’s must be able to charge each customer the right price for the data storage services that they have consumed. SQL Database provides the flexibility that ISVs need to segregate customer data and implement multi-tenant billing, which enables you to build a global S+S solution quickly and easily. One of the potential obstacles to building great cloud-based applications is the requirement for developers to learn new tools, programming platforms, and data models. However, SQL Database is built on top of the TSQL language and is designed to be compatible with SQL Server with a few changes, so developers can use their existing knowledge and skills. This reduces the cost and time that is usually associated with creating a cloud-based application. When developers create on-premise applications that use SQL Server as a data store, they employ client libraries that use the Tabular Data Stream (TDS) protocol to communicate between client and server. There is a large global community of developers who are familiar with SQL Server and have experience of using one of the many client access libraries that are available for SQL Server, such as Microsoft ADO.NET, Open Database Connectivity (ODBC), JDBC and the SQL Server driver for PHP. SQL Azure provides the same TDS interface as SQL Server, so developers can use the same tools and libraries to build client applications for data that is in the cloud. SQL Database data is stored in a way that is very familiar to developers and administrators who use SQL Server. You can create a SQL Database Server which is a group of databases that are spread across multiple physical machines. This SQL Database Server is in some ways conceptually analogous to a SQL Server instance and acts as an authorization boundary just as in SQL Server. You can also set geo-location at this level. Windows® Azure™ and SQL Database data centers are located worldwide; if your application is relevant to a specific region, you can increase performance by geo-locating it there. Within each server, you can create multiple databases that have tables, views, stored procedures, indices, and other familiar database objects. This data model ensures that your database developers can use their existing relational database design and Transact-SQL programming skills, and easily migrate existing on-premise database applications to the cloud. SQL Database servers and databases are logical concepts that do not correspond to physical servers and databases. This abstraction enables the flexible provisioning that was described earlier in this paper. Administrators and developers can concentrate on data model design because SQL Data Services (SDS) insulates them from the physical implementation and management. SQL Database is part of the rich Microsoft data platform which integrates with the Microsoft Sync Framework to support occasionally connected synchronization scenarios. For example, by using SQL Database and the Sync Framework, on-premise applications and client devices can synchronize with each other via a common data hub in the cloud. To see how these key features of SQL Database can benefit organizations, let’s consider some common business application scenarios. Most Web sites require a database to store user input, e-commerce transactions, and content, or for other purposes. Traditionally, such a data-driven Web site is implemented with a database server in the same data center as the Web server. Using SQL Database, Web developers can choose to place data in the cloud where it is highly available and fault tolerant. As with the departmental application scenario, you can host your Web application on your own server, or by using a third-party Web hoster, and access the data in SQL Database across the Internet. However, to avoid issues of performance and application complexity that latency causes, you should consider hosting the Web site itself in Windows Azure so that it can benefit from co-location with your SQL Database. In a large organization, qualified database administrators run the mission-critical, company-wide databases, which receive the benefits of their experience. These databases may also have fault-tolerant configurations that have uninterruptible power supplies, redundant array of independent disks (RAID) storage, and clustered servers. In contrast, a typical large organization also has many smaller database applications that IT-literate employees in departments and groups across the organization have created. They may have built such applications by using Microsoft Office Access®, Microsoft SQL Server® Express, or third-party software. The databases may be hosted on a single, cheap server, or even on a desktop computer, and they are typically managed by staff whose primary role is not data administration. Although the impact of a database failure is usually limited to the department that uses it, such interruptions can hamper productivity for large groups. It is also difficult to keep track of all such databases throughout your organization. SQL Database represents an excellent opportunity to reorganize such disparate database applications. By provisioning SQL Databases for small departmental applications, your users can benefit from the self-management capabilities and fault tolerance that SQL Database provides, without placing an additional burden on your IT staff. This centralized approach also makes it much easier to audit the databases in your organization. In addition, because SQL Database has a pay-as-you-grow pricing structure, you can run small database applications very inexpensively. When you migrate an on-premise client-server application to SQL Database, you can choose to leave the client application on premise and migrate only the data tier, which you can access by using common data access libraries across the Internet. However, if you use this application design, you must consider the latency issues that are inherent in Internet-based connectivity, which may result in more complex code in the client application. A better solution is to move the data access logic to Windows Azure, so that the same data center hosts both the data access code and the data itself. You can create a Web-based user interface (UI) in Windows Azure to which users connect with a browser. Alternatively, you can create a service by using ADO.NET Data Services to write code that exposes a SOAP, REST, or JSON interface to a simple desktop UI. Create a database in SQL Database to store product data and customer data. 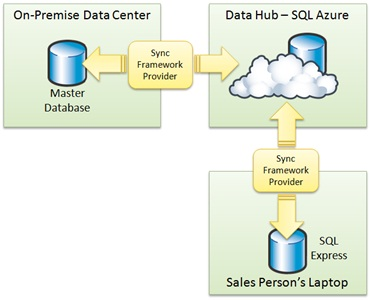 Create a Sync Framework provider for the data center. This Sync Framework provider keeps product and customer data synchronized between the data center and the SQL Database data hub. Create a second Sync Framework provider for the sales force’s portable computers. This Sync Framework provider keeps product and customer data synch ronized between the field salespeople and the SQL Database data hub. The diagram in Figure 2 illustrates this solution. Product pricing data flows from the enterprise database, through SQL Database, to more than five thousand salespeople. Customer contact data flows from more than five thousand salespeople, through SQL Database, to the enterprise database. When a salesperson’s portable computer is offline, changes that occur to local data are tracked. When the portable computer’s Internet connection is restored, the Sync Framework provider enumerates these changes and sends them to SQL Database. The safety of the corporate data center is ensured. ISVs can use SQL Database to offer Software+Services solutions without distracting themselves from their core software development competency so that they can develop a hosting infrastructure capability. Windows Azure provides an ideal environment to host software services without the overhead of maintaining the hosting infrastructure at the premises of the ISV or the customer. Consider an S+S vendor that provides compliance support to businesses, including financial, government, health-care, real estate, and franchising companies. Such organizations need to store historical data, such as financial records, business transactions, or correspondence, either for future reference or for compliance with record-keeping regulations. The S+S vendor employs a document management system for archived data that provides full text search, together with workflow functionality and check processing. The S+S vendor must also track and report access to resources as required for audit purposes. To reduce data storage costs and help to ensure rapid and secure access to records, the vendor wants to migrate its customers’ archive data to the cloud. To achieve this aim, the company can create an account with SQL Database, together with Windows Azure accounts within the company space for each of its customers. After customers have an account, they can upload any form of document, such as e-mail, scanned checks, and escrow documents. Some of the documents are stored as binary large objects (BLOBs) in the Windows Azure BLOB store, whereas other documents are stored as structured data in SQL Database with standardized data fields. In this scenario, it is essential to ensure that each customer’s data is isolated and only available to the right users. The S+S vendor can use SQL Database to implement this isolation and prevent inappropriate access. SQL Database also makes it simple to audit usage so that it is possible to bill customers appropriately. Developers who write this solution for Windows Azure will find that it is tightly integrated with SQL Database. For example, they can use the familiar SQL Server client libraries that they use on the desktop; they can use one Windows Azure account to authenticate a user across the cloud; and they can use the same geo-location properties for the Windows Azure code and the SQL Database data. In this section, you will see how SQL Database uses databases, how it structures relational data, and how you can connect to data. Provisioning Model SQL Database is designed to support extreme scale and low cost while providing a familiar environment to administrators and developers. It has the hierarchical provisioning model that is described below to achieve this. To use SQL Database, you must begin by creating a Windows Azure platform account. Using this account, you can access all of the facilities within the Windows Azure platform. This account is also used to bill for usage for all Windows Azure platform services. For more information on getting an account, see Windows Azure Platform Offers. Each Windows Azure account can contain multiple SQL Database servers. These servers are not implemented as SQL Server instances; instead, you can view them as logical concept that is used to provide a central administrative point for multiple SQL Database servers. Each server includes logins, just as you find in on-premise SQL Server instances, and you can also specify the geographic region your server is located in at this level. You use Windows Azure Platform Management Portal to create and manage your database server. This portal provides an easy-to-use interface where you can create logins and provision databases. Each SQL Database server can contain multiple databases. A new database server has a master database that is just like an on-premise SQL Server instance. In each database, you can create tables, views, indices, stored procedures, and other familiar database objects. You can use the Windows Azure Platform Management portal to create a new database. Alternatively, you can use the Transact-SQL CREATE DATABASE command, and SQL Database Management API. SQL Databases are implemented as replicated data partitions across multiple physical computers in an SQL Database data center. This architecture provides automatic failover and load balancing. Customer data is spread across multiple physical servers within the geo-location that is specified for the SQL Database server that is hosting the database. In this way, SQL Database achieves high availability and stability for all applications from the smallest to the largest without requiring intensive administrative effort. Tables: store data in rows with a consistent and normalized structure. Indexes: increase the speed of searches and maximize performance. Views: provide alternative ways to look at data in one or more tables. Stored procedures: store common Transact-SQL scripts for simple execution. Triggers: ensure data integrity by executing checks when data is modified. Both SQL Server and SQL Database use the Transact-SQL language for database creation and data manipulation. Database developers and administrators can therefore be productive immediately in SQL Database by using their existing expertise. For more information about Transact-SQL, see http://msdn.microsoft.com/en-us/library/ms189826.aspx. SQL Database exposes a Tabular Data Stream (TDS) endpoint to databases that are hosted in the cloud. TDS is the same network protocol that on premise SQL Server uses, therefore, a desktop client application can connect to SQL Database in the same way it connects to an on-premise SQL Server instance. Such an application runs code that was built by using ADO.NET, ODBC, or whatever technology you prefer to work with. Queries are formulated in the Transact-SQL language. Secure Sockets Layer (SSL) is required when a client application connects to the SQL Database TDS endpoint to ensure security. In this desktop client application/SQL Database scenario, you must consider the latency that may arise over the cloud and handle it in the client code. The latency is inevitably higher than it would be if the database was on your premises. One way to avoid this latency is to create a Web-based user interface for your database application and host it in Windows Azure. In this scenario, the client code and data is hosted in the same data center, so latency is low. Users connect to such an application by using a Web browser. You can also use this architecture for data-driven Web sites that are hosted in Windows Azure. In the third architecture that SQL Database supports, you can create application logic by using ADO.NET and the Entity Framework, and host it in Windows Azure. You can then use ADO.NET Data Services to publish this application as a service that uses a SOAP, REST, or JSON interface, and build a lightweight client application to consume data from the service. In this way, you avoid latency between the application and SQL Database, but you still provide an Internet-based service interface for your data, which you can then use in rich Internet applications or desktop solutions. SQL Server Logins: Used to authenticate access to SQL Database at the server level. Database Users: Used to grant access to SQL Database at the database level. Database Roles: Used to group users and grant access to SQL Database at the database level. You can store any amount of data, from kilobytes to terabytes, in SQL Database. However, individual databases are limited to 150 GB in size. To create solutions that store more than 150 GB of data, you must partition large data sets across multiple databases and use parallel queries to access the data. Data sharding is a technique used by many applications to improve performance, scalability and cost. Some applications are well suited for partitioning because they use data models with natural partitioning boundaries. For example, applications that store and process sales data using date or time predicates. These applications can benefit from processing a subset of the data instead of the entire data set. Data sharding also enables parallel processing of data. Applications can place multiple data partitions on multiple sets of compute resources and processes the data simultaneously. Although there is ample literature on the benefits of data sharding, little is said about the cost of managing a distributed database on tens or hundreds of servers. SQL Database provides the infrastructure for applications that require tens or hundreds of databases without the associated administrative cost. An application can partition large data sets into many databases without facing an exponential cost structure and up front capital investment. Provisioning and using three hundred databases is as simple as provisioning three databases. The management burden of keeping hundreds of servers functioning in a synchronized fashion and provide a highly available database is taken on by SQL Database. In addition, SQL Database provides elasticity in the scale out offering as an application can increase the number of databases when needed and decrease when the requirements change. The ability to scale down without cost penalties prevents the customer from being stuck paying for unused resources when they do not need them. Even applications with small data sets that require large processing capacity (CPU and IO) can also benefit from partitioning by gaining access to parallel resources. The decision to use a scale out database strategy is something that should be approached carefully as it can have an impact on the complexity of the application code and is not appropriate for every application, although the benefits described above may make it well worth the effort. It is possible to create and populate a database entirely in SQL Database by using Transact-SQL. However, in most cases, developers or administrators will design and populate the database on the premises on a development computer or server. When the application is complete, the database must be deployed to the cloud. To deploy a database to SQL Database, you can create a Transact-SQL CREATE DATABASE script in Microsoft SQL Server® Management Studio using the Generate Script Wizard. You can then run the Transact-SQL script in SQL Database to create the database. Geo-location for SQL Database is set at SQL Database Server level. Therefore, to deploy a database for a specific region, you should create a new SQL Database Server in that geo-location and connect to it to run the deployment script. In this paper, we have introduced Windows Azure SQL Database and described its key capabilities and benefits. SQL Database is a cloud-based database service that offers developer agility, application flexibility, and virtually unlimited scalability, with a flexible, cost-effective delivery model. The robust underlying architecture provides reliability, high availability, and security. In addition, support for the most prevalent Internet communication protocols ensures ease of deployment and use. We have examined some scenarios where SQL Database can offer real business value to customers, such as data hub solutions and archival and compliance systems. We’ve also taken a look "under the hood" at the architectural and programming models that provide the core functionality of SQL Database. This article was originally written by Jason Lee, Graeme Malcolm, and Alistair Matthews (Content Master). This article is also available in other languages, including Russian.